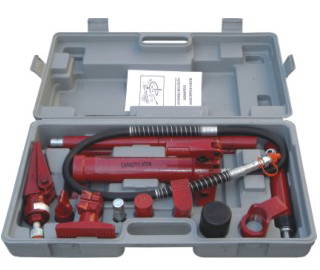 Portable hydraulic equipment is commonly used as a source of power for many types of presses, riveting machines, capstans, winches, and other machines. 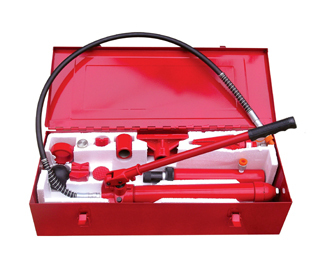 Portable hydraulic equipment consists essentially of two cylinders each filled with liquid and each fitted with a piston; the cylinders are connected by a pipe also filled with the liquid. One cylinder is of small diameter, the other of large diameter. Although the pressure (force per unit of area) is the same for both pistons, the total upward force on the larger piston is as many times greater than the force on the smaller piston as the area of the larger piston is greater than the area of the smaller piston. However, when the pistons move, the distance the smaller piston travels is proportionately greater than the distance the larger piston travels, satisfying the law of conservation of energy. The hydraulic press is used, for example, to form three-dimensional objects from sheet metal and plastics and to compress large objects. 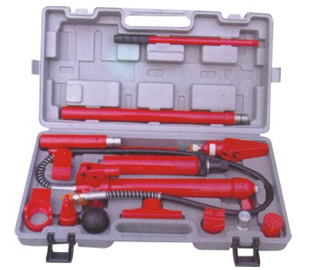 The Portable Hydraulic Equipment, also an application of Pascal’s law, is used to exert large forces or to lift heavy loads. Like the hydraulic press it consists essentially of two different-sized pistons contained in cylinders that are connected by a pipe. When the smaller piston is moved back and forth by a handle connected to it, it pumps a liquid into the cylinder of the larger piston, forcing the larger piston to move. In this way a weak force applied to the smaller piston can raise a heavy load on the larger one. The hydraulic elevator is also an application of Pascal’s law.